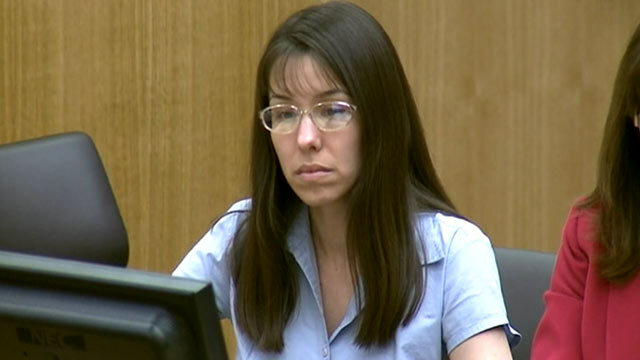 WATCH Jodi Arias Murder Trial: Who Is the Alleged Killer? Jodi Arias stabbed and slashed ex-boyfriend Travis Alexander with such force that a wound to his head chipped away bone from his skull and his throat was cut so deeply that the knife almost reached his spinal cord, the Maricopa County medical examiner testified today. The graphic testimony about Alexander's injuries came on the third day of Arias' murder trial in Phoenix, Ariz. Arias cried throughout the testimony and looked away from photos of Alexander's decomposing body taken by Medical Examiner Kevin Horn. Alexander's sisters, who looked away from the gruesome photographs for much of the testimony, eventually abandoned their courtroom seats and left crying. Horn also testified that Arias fired a bullet through Alexander's brain, likely after he was already dead. Establishing a sequence of events in the murder is crucial to the state's effort to secure the death penalty in this case. According to Horn, Arias stabbed Alexander at least nine times in his upper back and one time in his chest so deeply that she punctured a vein going into his heart. While he was being stabbed, Alexander likely put up his hands to block the blows or grab the knife, resulting in cuts on the front and backs of his hands and arms. Alexander suffered two deep stab wounds to the back of his skull which chipped away part of his skull bone. Arias then slashed his throat with a three- or four-inch slash wound, cutting his major arteries. "The jugular vein and carotid artery are both cut. It goes all the way back to the spine, three or four inches. It doesn't go through the spinal cord, but it cuts all the soft tissue and structure in front of the neck," Horn said, describing a photo of the slash across Alexander's throat. "He's going to lose consciousness within seconds and die a few minutes later," Horn said. "He could get up and walk a couple of feet, move, and then collapse," Horn said. The medical examiner said Alexander would lose consciousness within a few seconds. "If this was only injury (he'd die) probably in a few minutes," Horn said. Horn also described the gunshot wound, which he said would have caused Alexander to lose consciousness or die "very rapidly." The medical examiner said there was no bleeding near the site of the bullet wound, which could prove that Alexander was already dead by the time Arias shot him. Arias's attorneys have argued that Alexander was an abusive and threatening boyfriend and characterized him as a "sexual deviant." They claim Arias killed Alexander in self defense. In earlier testimony today, the jury saw grisly photos of a bloody palm print on a wall and floor taken in Alexander's house, at the scene of the killing. A crime scene investigator from the Mesa, Ariz., police department described the photos, which showed tile floors and walls of a bathroom and hallway that were covered in blood when Alexander was found dead in his home in 2008. Detailing photos presented by prosecutors Heather Conner, a latent print examiner with the Mesa police department, identified bloody smudges on the floor as shoe prints and pointed out a bloody palm print on the floor and on a door. She did not identify whose prints they were. The prosecution is attempting to prove Arias stalked Alexander after the pair broke up and he began dating other women. They allege that she murdered Alexander out of jealousy, and then changed her story twice when lying about the murder to investigators. Prosecutors have told the jury that Alexander was a devout Mormon who was seduced and then stalked by Arias. They dated from 2006 to 2007, but continued a sexual relationship until his death in 2008. +Jodi Arias: Who Is the Admitted Killer?